Where to Buy Dynazone 18-3-6, Dynazone 18-3-6 30% CRN Liquid Fertilizer Triazone Fe - 2.5 Gal - $66.95 for Sale with Fast Free Shipping! Dynazone 18-3-6 30% CRN Liquid Fertilizer Triazone Fe - 2.5 Gal is a balanced patented 30% controlled release nitrogen liquid fertilizer containing triazone that provides a readily available nitrogen supply for more uniform color and growth. Brexil Fe 10% Soluble Micronutrient..
DynaZone can be applied in low volume sprays with non-phytotoxic results and is compatible with most pesticides and other chemicals. DynaZone 18-3-6 is recommended for the following crops to prevent Nitrogen deficiencies and maximize yields: alfalfa, almonds,avocados, apples, barley, beans, broccoli, cabbage, cauliflower, carrots,celery, citrus, corn, cotton, cucumbers, eggplant, grapes, lettuce,milo, melons, rice, pears, pecans, peppers, potatoes, peanuts, strawberries, tomatoes, turf, turnips, and wheat. Citrus: Apply 1-2 gallons per acre. Trees & Ornamentals: Apply 2-4 quarts in enough water to ensure thorough coverage. Vegetables: Apply 1-2 quarts per acre in enough water to ensure thorough coverage. Low volume sprays should give the best results. Small fruit: blueberries, grapes, raspberries—Start initial application at early leaf stage at 2-3 quarts in enough water to cover. Apply weekly as needed. Greens: Use 20-32 oz. per 1,000 sq. ft. in a minimum of 2 to 4 gallons of water or in enough water to cover. Repeat as often as needed. Tee-boxes: Use 1.5 -2 pints per 1000 sq. ft. in a minimum of 2 to 4 gallons of water or in enough water to cover. Repeat as needed. Turf: Use 1 pint per 1000 sq. ft.in enough water to cover to apply 0.25 lbs. of Nitrogen. 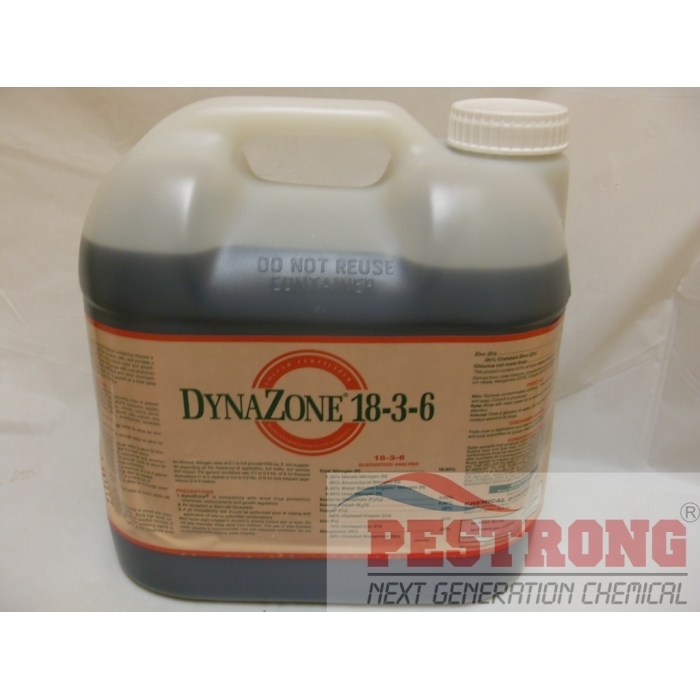 DynaZone may be applied as an undiluted spray or mixed with water where spray equipment requires more volume. Avoid high spray volumes (generally over 25 gallons per acre) where possible because of excessive run-off. Nitrogen rates of 0.1 to 0.8 pounds/1000 sq.ft. are suggested depending on the frequency of application, turf traffic, turf species and season. For general conditions use; 0.1 to 0.4 lbs. of N for frequent applications (1 to 2weeks) or 0.5 to 0.8 lbs. of N for less frequent applications(3 to 4 weeks). This 2.5 gals can cover 5,000 ~ 40,000 sq.ft. depends on nitrogen rate.